Plants vs. Zombies, PopCap Games's multiple award-winning, modified tower defense game, has hit the world like a storm. Players can purchase it for their PC, their Nintendo DS, their XBoxes, their Macs, their Androids, their iPad, their iPods, and their iPhones. It can even be played on Popcap's website. The game has also been mentioned in popular media by shows such as Modern Family. 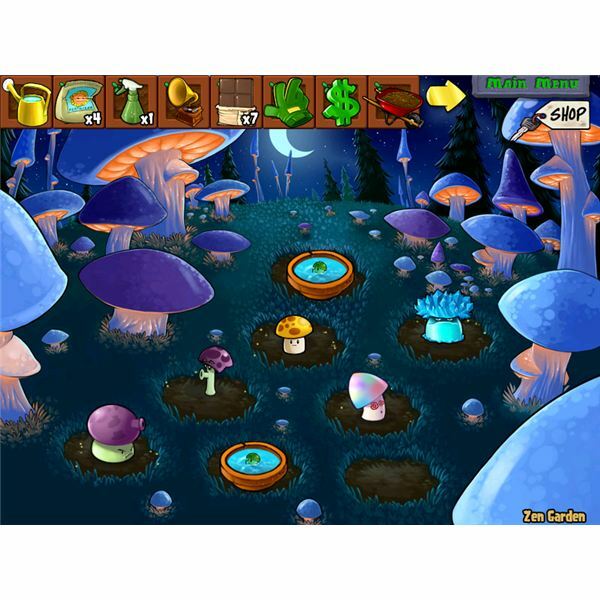 In addition, players of the game all over the world have decorated cakes, their nails, their boats, and even themselves as plants or zombies from this endearing, addictive game. Enjoy our reviews of Plants vs. Zombies, and join the die-hard fans that have bought this game on multiple platforms. Please keep in mind that there are minor differences between the various versions of this game, so some guides and reviews may be somewhat different from others. In addition, PopCap has continued to add to the game, so expect changes from individual guides as well. Plants vs. Zombies is full of varied gameplay and different challenges. The game can be played in numerous ways, and there is an incredible amount of content for such a "casual" game. One of the most straight-forward types of play is Adventure Mode. Players beat five levels of zombie attacks that consist of ten boards each, and in doing so they earn a silver trophy. They also get coin along the way to buy upgrade and perks for their plants and tools for fighting zombies. BrightHub has many tips, tricks, and strategies for helping players win their way through Adventure Mode. Please keep in mind that several guides may differ based on the platform for which they were written. Here are a few general guides to playing the game in case players do not want a step-by-step guide. Do not feel constrained by the guides as there are several different solutions to every board. These exist to help you when you are stuck or want to try alternate ways of defeating Adventure Mode. The Zen Garden is a fun and excellent collection system in Plants vs. Zombies. After reaching level 5-4 in Adventure Mode, the Zen Garden becomes available for use. (Please note that the Zen Garden does not exist in the iPhone, iPad, and iTouch versions of the game, and the Zen Garden guides are written primarily for PC and Mac players.) The Zen Garden allows players to collect plants dropped throughout the game in Adventure Mode, Survival Mode, and all of the puzzles. The plants can be tended and will drop gold. Players can water, fertilize and play music for the plants, and in return, the plants drop coins and diamonds. They can also be sold for a nice profit. The following guides help you learn everything there is to know about the Zen Gardens, including the Tree of Wisdom. Last but not least, Plants vs. Zombies is full of puzzles and mini-games, some of which are versions of their older puzzle games. Enjoy a zombie-fied version of Bejeweled, Insaniquarium, and Bejeweled Twist. Can't get enough of killing zombies with cute little plants? Enjoy Endless Survival Modes and face never-ending hordes of zombies wanting to take over the yard, the pool, and even the roof. If you get stuck, feel free to use any of our guides. Can't find a guide that you wish you could have? Feel free to leave your article suggestions here, and our Plants vs. Zombies experts will be quick to help. Last but not least, make sure that you participate in our discussion of What We Want for Plants vs. Zombies 2. Screen shots provided by the author from Plants vs. Zombies. Logo provided by PopCap Games. Articles provided by BrightHub writers.